Global Seminars: Day 13: Safari! Good evening from our camp, nestled peacefully by the Mwagusi river. The past few days in Ruaha National Park were a nice break from the busy schedule of visiting towns and hashing out preliminary designs. The coaster dropped us off at the park gate, and we quickly began the trek to the camp in three land cruisers. 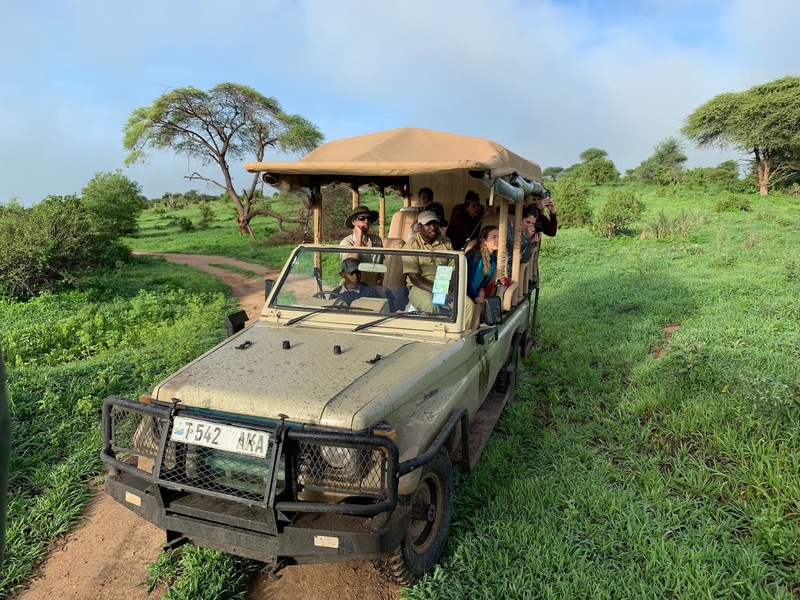 Almost immediately, we encountered a wide variety of safari animals that the park is famous for, including giraffes, elephants, zebras, and numerous impala. The highlight of the trip to the camp was fording the Mwagusi river with the safari vehicles. The camp is wonderful, consisting of little two or three person bondas. Each bonda is an open air structure overlooking the river making for a very relaxing atmosphere. The mornings and evenings each consisted of a three hour game drive, while the afternoons consisted of relaxing, playing cards, and an unbelievable amount of tea and coffee. 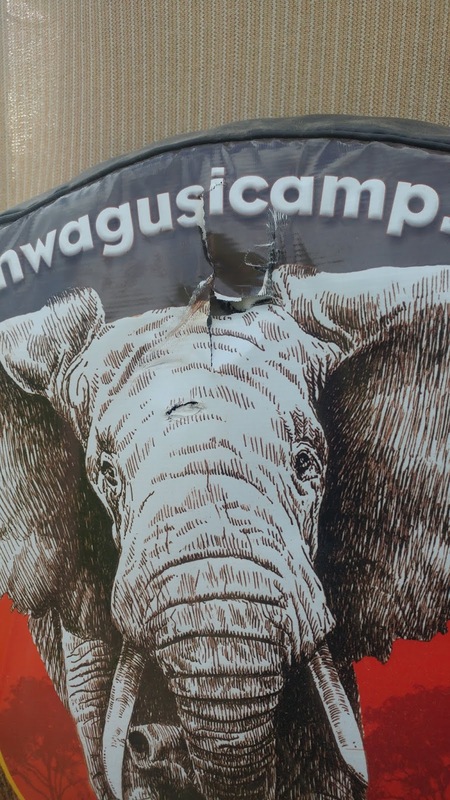 The first game drive began with an exciting experience as a mother elephant charged my safari vehicle, piercing the canvas which covered one of the spare tires. Luckily, the land cruiser was able to drive away before the situation escalated into a Jurassic Park experience. 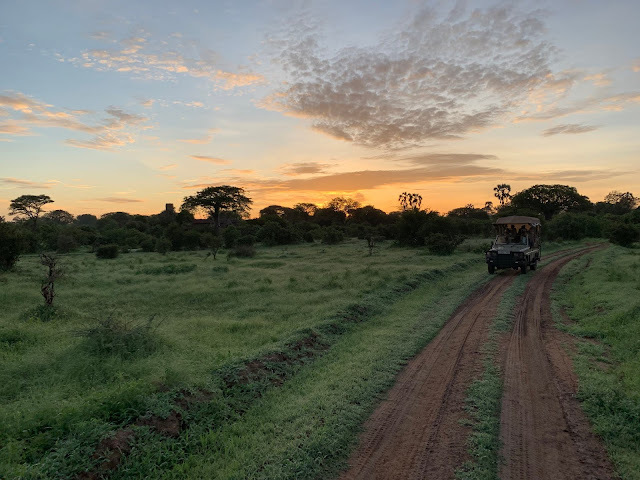 The next game drive began bright and early at 6:30 a.m. to try and catch some animals before the warm part of the day when they are typically less active. The drive was highlighted by seeing a pride of lions including five cubs. Additionally, four ostriches were spotted along the river. The third game drive included a rare leopard sighting, as well as racing the rain back to camp. On the way out of the park, multiple hippopotamus were observed along with a baby crocodile. Another pride of lions were also seen basking in the morning sun. Some of the additional animals spotted on the game drives included, greater kudu, leopard, tortoise, yellow baboon, bat-eared fox, warthog, Grant's gazelle, black-backed jackal, banded mongoose, and lizard. Ruaha National Park is also a great spot for those interested in bird watching. Some of the notable birds we saw included white-billed bustard, social weaver, lilac-breasted roller, grey crowned crane, southern ground hornbill, African grey hornbill, superb starling, white stork, southern red bishop, African fish eagle, Von Dee Decken's hornbill, red and white-headed buffalo weaver, red-billed buffalo weaver, black-faced sandgrouse, European roller, eastern chanting goshawk, ibis, little bee eater, bush chicken, and Guinea fowl.